IN THE summer of 1990, Charlie Reid played a central role in what became the defining day of the ultimately successful resistance to Wallace Mercer’s attempt for Hibs to be subsumed by Hearts. As the headline act at the Hands Off Hibs rally at Easter Road, The Proclaimers helped articulate a mood of pride and defiance which was crucial to ensuring that Mercer’s plan was foiled. Charlie was on his own at The Hibs Club yesterday, although his twin brother Craig would undoubtedly share the same sentiments which he expressed as he backed the launch of the “Petrie Out” campaign. While it was under Terry Butcher’s watch that Hibs slipped into trouble this season and ultimately fell through the play-off trap door, Reid insists the manager should not carry the can on this occasion. “My feeling is that we’ve sacrificed an awful lot of managers but Petrie’s still there,” added Reid. “Terry Butcher and Maurice Malpas don’t become bad managers or coaches overnight – something happens when they come to this club. “Previously successful people fail when they come here. That reflects to me that there is a deep problem that can only be solved by restructuring at boardroom level, with new blood coming in and a new direction being taken. “If the fans stand united, it’s going to be impossible for Petrie to stay on. My own personal feelings about him have got nothing to do with that. In the last 15 years or so, there have been a lot of good things happening at the club but they’ve tried to run the playing staff on the cheap. 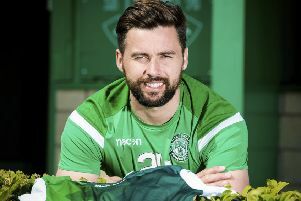 “It’s interesting that clubs like Aberdeen, Dundee United and even St Johnstone are signing players that Hibs failed to attract. It’s either a lack of money or perhaps there’s a feeling that this is not a good place to work at. I’m speculating that that may be the case, and if it is, then it has to be sorted at boardroom level. “Personally, I would never withhold season-ticket money. I’ll always back the Hibs. I’ll always go, whether they’re playing in Leith Links or Inverleith Park. But you can only expect people to take so much for so long. “My feeling is that maybe the Hibs supporters have been too tolerant for too long. “We need new investment and we need people to have the confidence to come and invest in the club. “We need supporters to stay united; we need to get the gates up and get people coming back. For that to happen, there needs to be a feeling that there is a communication between the fans, the playing staff and the board. “There’s something gone badly wrong at boardroom level. Rod Petrie’s been the top man for a very long time, so if you’re going to take the plaudits for the new stadium, you have to take the brickbats for what’s gone wrong on the pitch. “The club has to stay united for whoever’s going to be mobilised to fight for it. “Paul Kane’s spoken very impressively – he’s got good leadership qualities about him the same way Kenny McLean’s dad did 24 years ago. People gravitate towards him. It’s important the supporters stay focused on the objective but I hope nobody withholds money from the club.